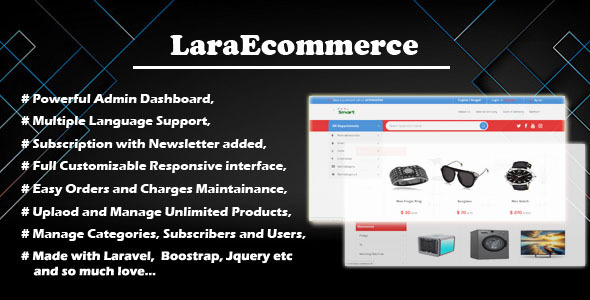 LaraEcommerce is a complete and responsive Ecommerce Content Management System (CMS) for your online business. This CMS has a nice and attractive front end and back end interface that are really awesome and eyecatching. The back end has a lot of nice and maintainable features that are needed for a modern and professional ecommerce website to handle the contents easily by client. Admin can manage complete website without single line of coding knowledge. It has many important section whice are important for any ecommerce business website and everything is fully dynamic. This script is fully responsive for any device.